I’ve done some updating to the Manufacturers page here on The Small Trailer Enthusiast. I’ve broken down the page into four sections: Travel Trailers, Teardrop Trailers, Fiberglass Trailers, and Pop-Up Trailers & Tent Campers. In the old format, I had all the manufacturers in one huge list. To my surprise, no one’s ever asked me to make it a little more user friendly, but breaking it down into categories was something that’s been on my to do list for quite some time. I’ve also added several manufacturers in the process of putting together the categories. To access the Manufacturers page, click here, or on the tab above. Hope this makes your search a little easier and saves you some time. The Manufacturers page is the most popular section on the site, so if you ever come across some broken links, let me know at pat@smalltrailerenthusiast.com and I’ll take care of them. When Paige Bridges and her husband David purchased a 22′ Nomad travel trailer in 1998, little did she know it would foster something big that was based on something small. Upon graduating from Marshall University with a fine arts degree, the Bridges’ found themselves in Van Zandt County, Texas where they began to raise a family and where Paige ultimately began giving private art lessons. In 1974, the Bridges’ purchased an abandoned catfish restaurant that also served as a bait & tackle shop and gas station. With 5 children and determination, they were able to turn it into their primary residence as well as an art studio where Paige started giving lessons. With her kids all grown and moved away, Paige added a custom frame shop to the art studio where she teaches two days a week. After they had purchased that 22′ Nomad in 1998, they moved up to a large fifth wheel trailer. 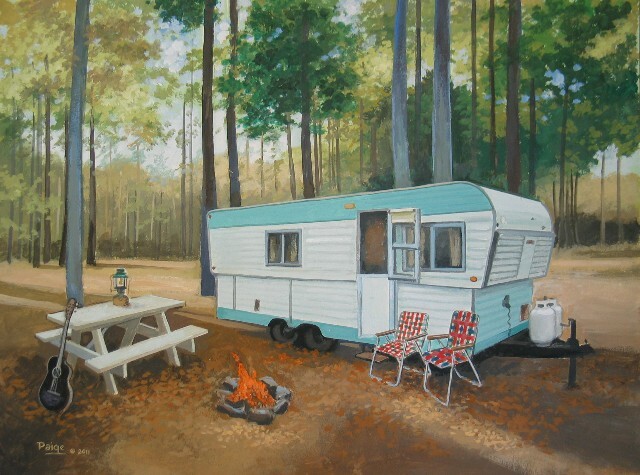 In 2003 Paige created an oil painting of a 1956 Shasta towed by a woody station wagon for the living room of their new fifth wheel. Out of curiosity, she created a print of her painting and put it up on ebay to see if there was any interest in a small trailer painting. Overwhelmed by the positive reaction from her painting (called “Days Gone By”), Paige began working on a series of “canned ham” trailer paintings and began selling them on ebay as well as her website. But it doesn’t stop there. Several of her artwork have been used by Current Catalog, including a line of personal checks, address labels, calendars, and even Christmas cards. 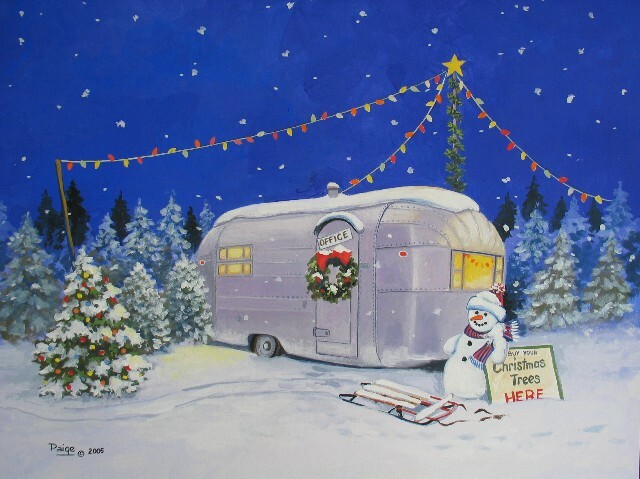 With the tally of her trailer paintings now in excess of 80, there are a few that she’s particularly fond of. 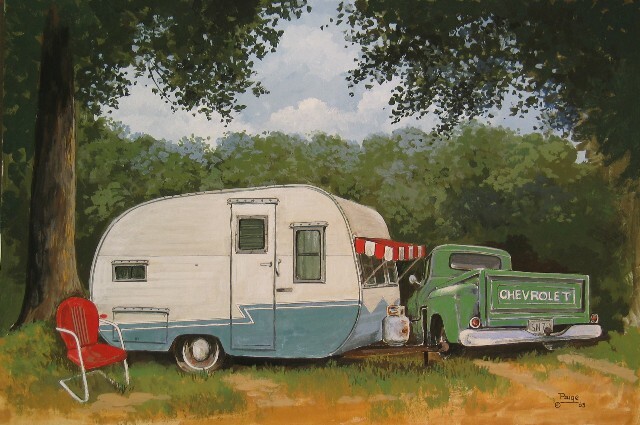 “There are a handful that always make me smile or bring back fond memories of my working on them.” One of which is entitled “Boondocking”, a piece featuring a 1956 Westerner that she found in a cow pasture in Marshall, Texas. Through the magic of her brush and canvas, she was able to “restore” the Westerner and park it next to a 1952 Chevy pick-up. 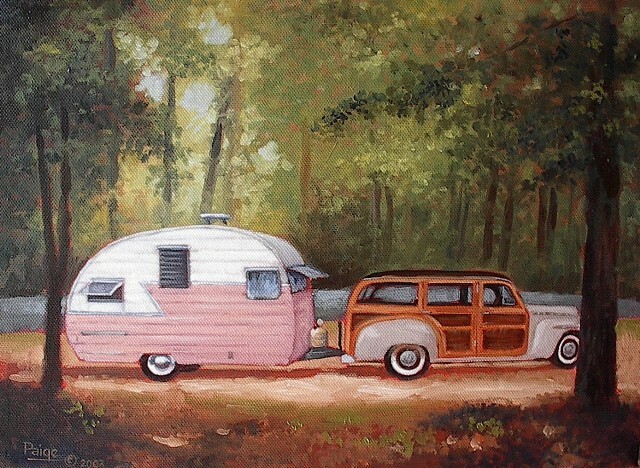 To view and order all of Paige’s travel trailer art, you can visit her website at http://www.vintagetraveltrailerart.com.